1. Place popcorn in a large bowl; set aside. Place a sheet of waxed paper on work surface. 2. Heat caramels and cream in a small sauce pan over medium-low heat. Stir frequently until caramels are melted and cream is blended into caramels. 3. Push a stick into an apple center and dip into caramel. Spoon caramel over apple to coat completely. 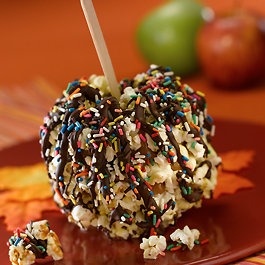 Place caramel coated apple into bowl of popcorn and press popcorn onto caramel to cover completely. Place apple on waxed paper to set; repeat with remaining apples. 4. Place chocolate chips in a small, resealable plastic bag. Microwave 10 seconds and press chips to aid melting. Repeat, heating at 10-second intervals, until chips are completely melted. Cut a small corner off bag and squeeze chocolate onto each apple allowing chocolate to drip down sides. Sprinkle with sugar sprinkles. 5. Tie a bow to each apple stick, if desired. To serve, cut apple into slices.